Over the years, the solitary throwing event in the European Athletics Indoor Championships has provided plenty of drama. Records have been broken, stars have left their mark on the event, and athletes have made a name for themselves with just one throw of the heavy shot. Here we’ve picked out three memorable moments that went down in history. A legend of the sport announced himself on the big stage with his first indoor gold medal back in 1987. In Lievin, France, Ulf Timmermann set a Championship record with 22.19 metres, over half a metre past silver medallist Werner Günthör from Switzerland. The victory in Lievin was the first glimpse of what was in store for Timmermann. The German went on to win Olympic gold the following year at Seoul 1988 and became the first man to throw past 23 metres in the same year in Greece, creating a legacy that will never be forgotten. European Indoor champion in 2015, Anita Márton successfully defended her title in Belgrade to etch her name into the history of the sport. The Hungarian, who clinched Olympic bronze in Rio, impressed in qualification with an 18.44 metre throw, but really upped her game in the finals. Managing a 19.23 metre distance in 2015, Márton went even further in Serbia to reach a massive 19.28 metres to take the world lead and secure a consecutive European indoor gold. Márton then went on to claim a World Championship silver just months later in London, before going one better with a World Indoor Championship gold in Birmingham earlier this year. 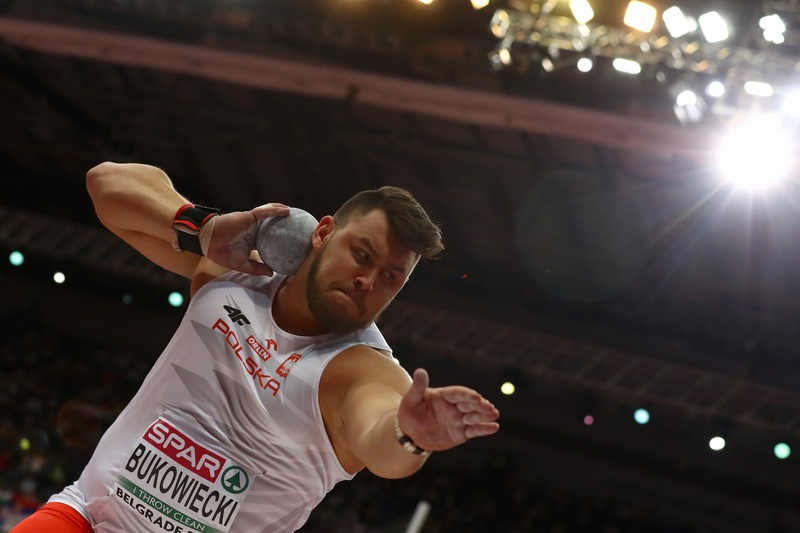 At the same Championships, Konrad Bukowiecki stunned the crowd in Belgrade with a whopping throw that immediately set high expectations for the young man’s future. Just 19 years of age, the Pole unleashed an incredible 21.97m effort to propel himself to the top of the leaderboard, where he stayed from then on to claim his first senior gold medal. Despite his following throws falling short of that monstrous attempt, three efforts of 20.69m, 20.85m and 20.98m proved the youngster’s potential in the event.